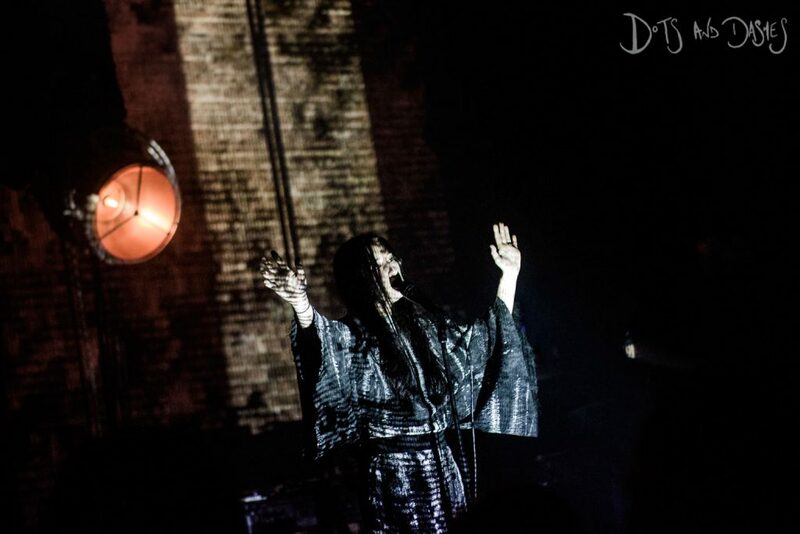 Nicole Hummel – better known as Nika Roza Danilova, but known better yet as Zola Jesus – seems destined to represent a perennially liminal player, although this evening, at east London’s Village Underground, this status appears perhaps more purposeful than ever previously. Thus in the temporal space that’s vacated by onetime Majical Cloudz man Devon Welsh, who himself puts in a particularly impactive solo performance in support of Danilova, classical music is solemnly diffused throughout this former railway coal store as though it were sweet frankincense from a censer, to create a quite disorientating, if not quite disconcerting ambience. It’s one in which Danilova has long since thrived of course, and while her audiences here in London may not be vast, they’re certainly devout: the Psychocandied Clay Bodies, from eight-year-old début album The Spoils, is as deferentially received as Witness and Siphon – the parial centrepiece of both the night and this year’s Okovi full-length – which precede it. “About [her] uncle’s suicide attempts last year,” it stands out as both a bold and emboldening bipartite triumph in the gooseflesh as much as it does on record, Danilova tearing away at what can, at times, seem a somewhat tetchy exterior to expose a childlike determination in the stern, unswerving face of PTSD-induced depression. “Second chance to pull you from the wreckage of your mind/ I’ll do anything I can to rip you from the edge in time,” she resolutely asserts come Witness’ second verse, Louise Woodward’s viola evoking the visceral orchestral clout of U Strings on Vulnicura all the while. And whilst comparisons with Björk can seem all too commonplace – and all too often misplaced, also – in this particular instance, it’s completely meet and right so to analogise. However, whereas Vulnicura heavily relied upon, and in turn derived much of its success from, Björk’s entanglement in lavish strings, the classical learning so frequently cited by Danilova as a leading influence is fairly infrequently discerned this evening. Beginning with the apian frenzy of Woodward’s bow, Exhumed makes for what is, instrumentally, among the most interesting renditions, and concludes with Danilova’s infamously diminutive figure thrashing its way around the audience with commensurate freneticism. Likewise, Skin – grafted from Conatus, 2011 – is the sound of uninhibited reinvention, this more skeletal, if less spectral take a great improvement upon the original, as longterm collaborator and sometime co-producer Alex DeGroot’s ferric guitar work also brings an aeruginous sourness to it. But otherwise, way too often, we bear witness more to repetition than invention, as the likes of Soak, Veka and Wiseblood – all lifted from Okovi – do ineffably little to expand upon prior releases. Granted, they’re good, with the formermost a commendably deft mix of dark, crepuscular production and incongruously optimistic chord progressions, although they don’t necessarily demonstrate the necessary progression shown in, say, BANKS’ stepping up and on from Goddess to The Altar and beyond, deep into mainstream consciousness. Moreover, in performing as a trio comprising she, DeGroot on guitar and Woodward on viola, many of the songs – the likes of Dangerous Days and Hikikomori, for example – become that bit more homogenised than they may have sounded otherwise, such is Danilova’s over-reliance on her backing tracks. Again, granted: she never achieves the same level of farce that St. Vincent did at her recent O2 Academy Brixton debacle, but with the rhythmic components of these songs among, if not their most integral musical elements, the ability – or, at the absolute least, the possibility – to properly shake things up, as opposed to occasionally paring down, is completely lost. There are points at which this isn’t so much of an issue – an industrial, leaden Night thunders along just fine, as do the the dated, Downward Spiral-like thuds of Vessel – although these are, rhythmically, all the more simplistic than so many of the songs in Danilova’s canon, and don’t therefore suffer for this fact quite so dramatically.